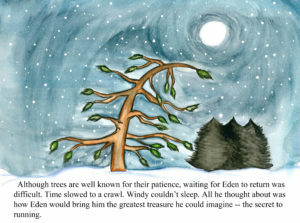 A small fir tree named Windy has a single, overriding desire – to run. From his hilltop park, he watches people of all ages run and play among the trees. He wants nothing more than to do the same. He befriends a young girl who tries to teach him how to create his desire.